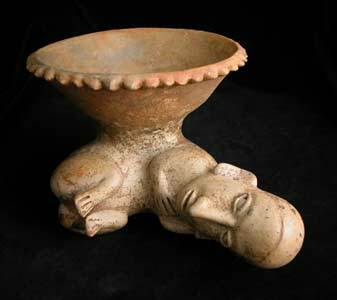 Jalisco Bowl Supported by a Recumbant Man - PF.0284, Origin: Western Mexico, Circa: 300 BC to 300 AD, Dimensions: 5.5" (14.0cm) high x 10" (25.4cm) wide, Catalogue: V2, Collection: Pre-Columbian, Style: Jalisco, Medium: Terracotta. Such a bowl was buried in an ancient shaft tomb and used to hold an offering of food or incense for the deceased. The human figure curled up in an almost fetal position who supports the vessel may in fact represent the dead. We are touched by this ancient gift, a token from the world of the living to ensure that eternity was not without its comforts. A rare and stunning example of ancient Meso-American ceramic art.